If your brand new amputee dog or cat has a puffy swelling at the incision site, odds are pretty good it’s a “seroma.” This fluid build-up usually isn’t serious but it does require some extra attention. 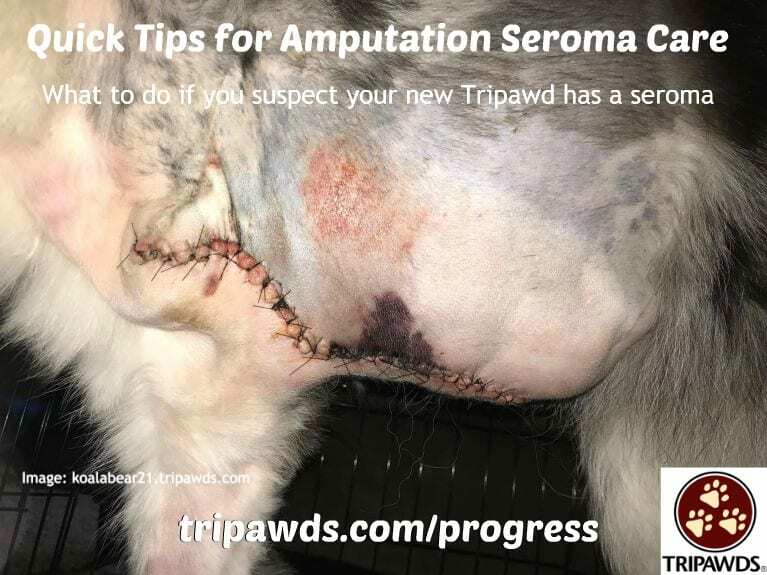 These tips for Tripawd amputation seroma care should help. We all know that our bodies are filled with fluids. So when part of a body is taken away, that fluid has to go somewhere, right? For new amputee pets, that fluid should reabsorb into the body, but sometimes takes the path of least resistance and pools up at the incision site. What does a Seroma look like? A Tripawd amputation seroma looks puffy, like a water balloon all around the incision area. Actually, this can happen in any kind of surgery, even a simple spay/neuter procedure. You may notice a clear, watery, pinkish fluid leaking out too. In this short video, Dr. Krista Magnifico demonstrates. Her article about dog seromas, “Seroma, the Pocket of Fluid to Keep Quiet,” is helpful. The fluid is not thick, purple or bloody in color. Nor is the fluid warm to the touch. Either way, your vet needs to know about the suspected seroma. The fluid will usually reabsorb into the body without intervention. But if it’s an amputation infection and is not treated quickly, bacteria can get in and destroy tissues around the sutures. 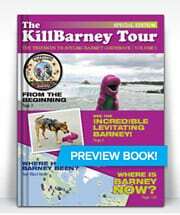 They might even come undone and require a “debridement” surgery to remove the dead tissue. Don’t let this happen to your new Tripawd. Follow these tips. Tripawd amputation seroma in Jill the Cancer Fighting Tripawd Kitty. Call your vet to let them know you suspect a seroma. But before doing so, watch how quickly the fluid is dripping and make a note of it for your vet. If the fluid drips faster than one drop per second, the vet will probably ask you to come in. Meanwhile, you can do a few things help your pet’s body absorb the fluid. Apply a warm compress on the seroma area. Just get a nice old soft face cloth or hand towel and run some warm water on it. I start out with hot, wring it out then shake it till it gets to a nice warm temp but not too hot. Gently place the face cloth on the incision and hold it there for a few minutes. That’s really all there is to it. I wring it out pretty well too.. so that it isn’t dripping. You can do this several times a day. Try a cabbage poultice. Believe it or not, a cabbage can speed wound healing and ease joint pain. Click on the link to follow application instructions by Tripawds member Dottie. This cabbage poultice application video shows how to make one too. Keep you pet quiet and avoid too much activity. Seromas can be caused by moving around too much before the body is in full healing mode. Keep your Tripawd mellow during recovery time. Use the Cone of Shame. We can’t say it enough: a cone of shame is the best way to guarantee your Tripawd won’t bother the incision and create a worse situation at the seroma site. Dogs and cats can destroy incision sutures even when you think you are watching. Don’t risk it! Irie’s mom suspected a seroma. She was right. An amputation seroma looks scary but it’s usually harmless. If you think your Tripawd has a seroma, don’t panic. Let your vet know what’s going on as soon as you can and come to the Tripawds Treatment and Recovery Discussion Forum topic for support from the community.